This famous statement by the Federal Circuit’s former Chief Judge, Giles Rich, is still true today. In fact, the two patent decisions the court issued the third week in December are all about the claims. This case focuses on the classic claim construction inquiry, which patent examiners, practitioners, and judges use to figure out what technology is covered by patent claims. During a reexamination proceeding, a U.S. Patent and Trademark Office (PTO) examiner reviewed this patent relating to an apparatus for controlling the input of another device, such as a control for an AV projector . The examiner rejected all of the claims as obvious. Remember, PTO examiners determine claims’ broadest reasonable construction to decide whether they are patentable. This standard is different from the one courts use to decide if the patent is invalid or infringed. The obviousness issue, in this case, turns on two claim limitations. The examiner’s construction of the first disputed limitation “a frame to which the control circuitry and keys are mounted, wherein the frame has slots extending through said frame for receiving labels” does not require a frame with separate slots for labels and keys. In this context, labels contain a legend that identifies an input device and keys correspond to one of the input devices. Because the language of claim 1 itself doesn’t distinguish slots for labels and keys, and nothing in the specification adds that limitation, the Federal Circuit concluded that the examiner’s construction of “slots for receiving labels” is correct. So the Board of Patent Appeals and Interferences’ decision upholding the examiner’s rejection of all of the patent claims was left intact. Here’s the SP Controls opinion, if you want to read it yourself. This opinion focuses on claims too. But the question here is whether two parts of a patented assembly are structurally distinct pieces. It sounds like a small issue, but the answer makes or breaks Sony’s noninfringement case. Electronics like laptops use heat sinks to dissipate heat created in electronic circuits and cool components such as microprocessors. ICHL has a patent on a heat sink assembly with two “fin structures” (labeled 16 and 18) affixed to a “top plate” surface (labeled 12), which is sometimes called a “thermally conductive planar member.” The patent discusses bonding of the fin structures and the top plate using materials that conduct thermal energy. The parties disagreed about whether the claimed “top plate” and “fin structures” must be structurally distinct parts of the assembly. Both the district court and the Federal Circuit construed the claims to mean that the “top plate” and alternative “thermally conductive planar member” are structurally distinct from the “fin structures.” The court based its construction on the claim language, the specification’s description of the invention, and the inventor’s disparaging comments about prior art that contained a unified structure in the specification. 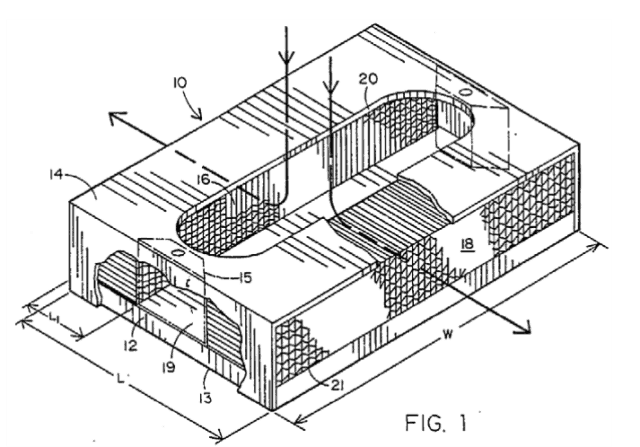 Since Sony’s heat sink has fin structures and top plate that aren’t structurally distinct, Sony gets to keep its noninfringement judgment by the district court. So, you see, the name of the game is the claim. Here’s the ICHL opinion, in case you want to read it. Making the Trump Name Drumpf Again? Don’t Mess With A Judge. Just Don’t. At DecodingIP™ our focus is on interesting intellectual property and technology law issues that are making headlines. You’ll also see updates on e-discovery trends, social media and IP, software issues, celebrity branding, and famous trademarks. Decoding IP™ is not a canned, boring summary of court cases using rehashed legalese. We explain intellectual property and tech issues making headlines, in plain English, and why we think they’re important–both legally and practically.